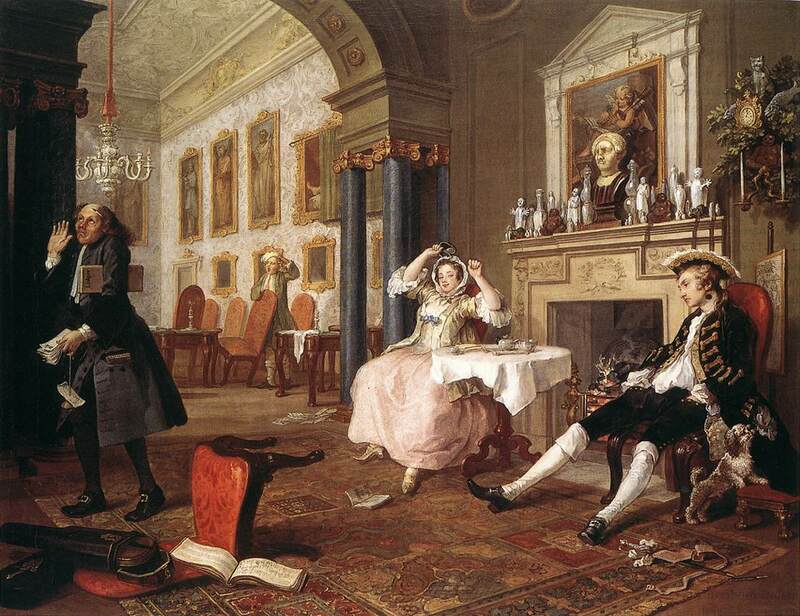 There was nothing romantic about marriage in England before the 17th Century. The institution was viewed as a means of securing or advancing the family fortune. Alliances through marriage were arranged by parents; offspring were regarded as pawns; and couples were often engaged and wed while they were still children. The engagement between them is of a peculiar kind. From their infancy, they have been intended for each other. It was the favourite wish of his mother, as well as of her’s. While in their cradles, we planned the union: and now, at the moment when the wishes of both sisters would be accomplished in their marriage, to be prevented by a young woman of inferior birth, of no importance in the world, and wholly unallied to the family! Do you pay no regard to the wishes of his friends? To his tacit engagement with Miss De Bourgh? Lady Catherine was right. Mr. Darcy’s immense fortune would have attracted the most desirable women in all of Britain. The fact that he proposed not once but twice to Elizabeth gave Pride and Prejudice, to my way of thinking, a Regency fairy tale ending. While finding a suitable husband was the ultimate object of a young girl who was coming out, her life after the marriage would not be her own. Once the vows were said, the husband took charge of his wife’s possessions and she would have little say in how he chose to spend her income. Woe betide the poor woman who made a miserable match, or who did not bear her husband male children. In Maria, or the Wrongs of a Woman, a novel written in 1798 by Mary Wollstonecraft about a spectacularly bad marriage, the landlady lamented, “Women must be submissive. Indeed what could most women do? Who had they to maintain them, but their husbands?” (Chapter Thirteen). Not all marriages led to an unhappy ending, however. The first Duke of Richmond was an inveterate gambler. While staying in The Hague (Holland) in 1719, he lost a huge sum to the Irish Earl of Cadogan. At the time, the earl’s daughter, Sarah, was only thirteen years old. The Earl of March, the duke’s son, was eighteen. To pay off the debt, the Duke of Richmond agreed to an engagement between Sarah and the young earl, and a reduction of 5,000 pounds in Sarah’s marriage settlement. The deal sealed, the wedding was hastily arranged between the girl and the young earl, who had plans to embark on a Grand Tour with his tutor. It seems almost incredible to our nineteenth century civilization that the marriage of this nobleman when Lord March, during his father’s lifetime, and a mere youth at college, should have been a bargain to cancel a gambling debt which his father was unable to meet. “The young Lord March,” writes Sir William Napier, “was brought from college, the lady from the nursery for the ceremony. The bride was amazed and silent, but the bridegroom exclaimed, ‘Surely you are not going to marry me to that dowdy?’ Married he was, however, and his tutor instantly carried him off to the continent. Lady Sarah went back to her mother, a daughter of Wilhelm Munter, States Councillor of Holland. Three years afterward Lord March returned from his travels, an accomplished gentleman, but having such a disagreeable recollection of his wife that he avoided home, and repaired on the first night of his arrival to the theatre. There he saw a lady of so fine appearance that he asked who she was. ‘The reigning toast, the beautiful Lady March.’ He hastened to claim her, and they lived together so affectionately that, one year after his decease, in 1750, she died of grief. Thus in an extreme form, [the 2nd Duke of Richmond and his duchess] acted out the powerlessness of aristocratic children, who could become pawns in a parental chess game, who were sacrificed for family alliances or sold for money and prestige. Absolutely brilliant. I can’t find this kind of thing anywhere else. on July 6, 2008 at 17:19 Schoey C.
Seconded. I am delighted that you think Jane intended something of a fairytale ending. In an Austen course I took a couple years ago, we were all pretty hard-up for dooming Mr and Mrs D’s marriage because the novel ends somewhat ambiguously. The more I read, the more inclined I am to think that Darcy’s affection is real – especially given the evidence above. Lizzy’s, however …. In France at the same time, aristocratic marriages, not only engagements, happened when the spouses were very young. The bride had to be at least 12, the groom had to have turned 14. And people really married that young, at least in the upper classes. On the other hand, Vic, this was the era when the ideal of companionate marriage took hold, and Tillyard tells us of Caroline’s marriage to Henry Fox for love, and how despite Fox’s affairs, he actively sought to have a loving fulfilled relationship with his wife. The fascinating thing about this era is the tension between the two norms, for companionate marriage became more than something lip service was paid to by the end of the century. We find many love matches, even if (as in the case of Sheridan and Elizabeth Linley) the result was disastrous. Austen testifies strongly to the desire for and rightness of love in marriage. She tells her niece in effect the same thing one of the Watson sisters say: do anything but marry without love. I heartily agree with the first comment. Your site is wonderful, since I am interested in the Regency Era. I had never known this bit of information that you have posted and it is VERY interesting! I’m a huge fan of your website. Thank you so much for these gifts. But what about Edward Ferrars in S&S? I’ve never quite understood how his mother was able to disown him. I’m sure it must somehow be a special case, but it’s a mystery to me. An excellent point, Katxena. Generally males inherited the estate, except in a few cases. If a woman had no brothers and if the estate was not entailed to the closest male heir (as in the case of Mr. Bennet/Mr Collins), then she stood to inherit when her parents died. Mrs. Ferrar’s case is an unusual exception, for she was left in control of the purse strings when her husband died, a circumstance that rarely happened. John Hopfner (Republic of Pemberley) stated: “But even if the head of the family died leaving only one daughter, the daughter almost surely will marry — and at her death her heirs would be, presumably, the children she had with her husband.” It was evident that after her husband’s death, the will was written in such a way that Mrs. Ferrars retained controlling power over her sons. The story of the Earl and Countess of March is a story straight out of an Eloisa James novel! Even though my period is at the end of the 19th century, I’m forever fascinated by the dynamics of marriage, love and power in the upper classes of just about any era. Thanks for the explanation Ms. Place. That helps a lot. Everytime I’ve read S&S, I’ve been tripped up by that. This is the best information that I have encounted in a long time. Your knowledge is outstanding and I will be visiting this website more often. You have attracted another fan! Thank you, Holly. That is quite a compliment. I cannot thank you enough for this wonderful information. It really is a help for a Jane Austen fan like me to understand the social customs of the era. This site will certainly be in my Favourites list! Thank you so much for this information! I am writing an Essay for class about Jane Austen and how the realities of the Regency Era affected her writing, and this site was immensely helpful! You have no idea how hard it is to find decent, reliable information!